How to import a Google calendar? Introduction to the Calendar interface and its main components. How to create a personal calendar, group calendar or remote calendars. Steps to edit details and properties of a calendar, to set the calendar color, and to delete a calendar. How to import calendars or export calendars to a calendar application that supports the iCalendar format. 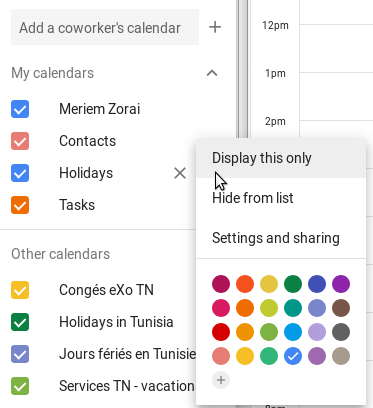 Information about setting permissions on your shared calendar and how to share your personal calendar with other users so that they can participate in all activities of the calendar. How to to perform common actions with events in Calendar: creating, editing, deleting, importing and exporting events. Steps to change the Calendar preferences. Steps to publish your calendar as an RSS feed. Steps to add, edit and delete categories which are used to classify events and tasks. The Calendar interface has 5 basic components. : The Toolbar contains most of actions in Calendar, such as adding an event, switching between view modes and more. 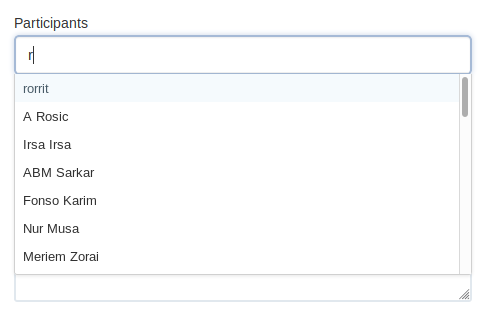 : The Search Pane where you can perform quick and advanced searches. : The Mini calendar where you can go backward/forward months by clicking / . Also, you can jump to your desired date by directly clicking that date. 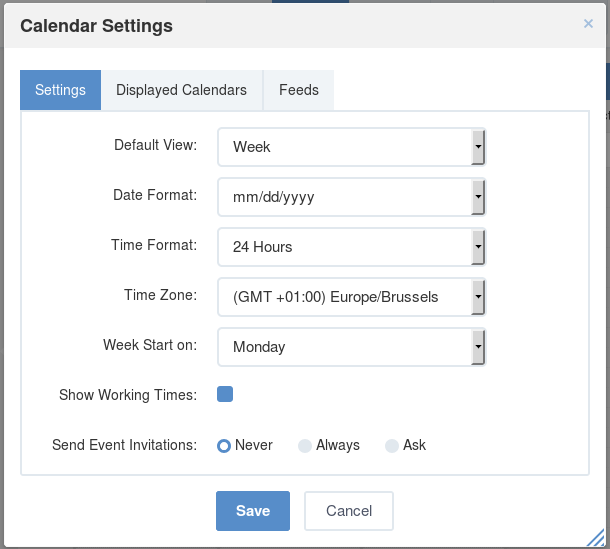 : The Calendar View pane where you can create events quickly and view your own events. Personal Calendars: Your private calendars. Group Calendars: Calendars of groups in which you are a member. Shared Calendars: Calendars which others share with you. If the Task Management application is installed by your administrator, you will see another Calendar group named “Task Calendars” below your Group Calendars. Each project from this application will have an individual calendar here but for view purpose only. Under the group, there will be also a Tasks calendar that displays all tasks assigned to you. You may create a personal calendar or group calendar that can be shared with specific users or groups to your desires. You can also create a calendar which is synchronized with a remote calendar. 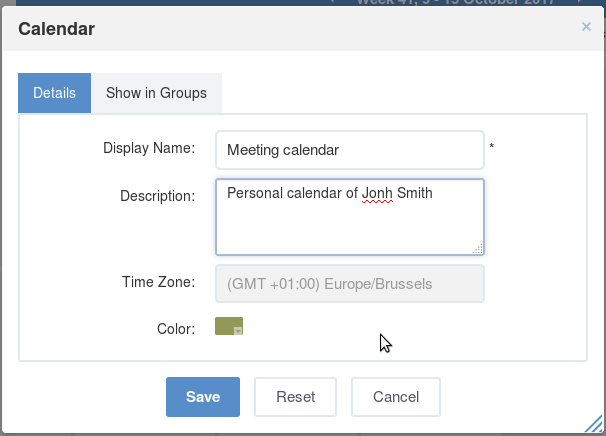 All personal calendars will be put in the Personal Calendars pane. Click , then select Add Calendar from the drop-down menu. Fill in fields of the Details tab. Display Name The calendar name which is displayed. Description The brief description of the calendar. Time Zone The display time zone for the calendar activities which cannot be edited. However, you can change the time zone in your calendar settings. Color The display color of the calendar activities that can be personalized. If you select the Show in Groups tab, then click to define specific groups and click , the calendar will be put in the Group Calendars category, not in the Personal Calendars category. Click Save to finish your creation. 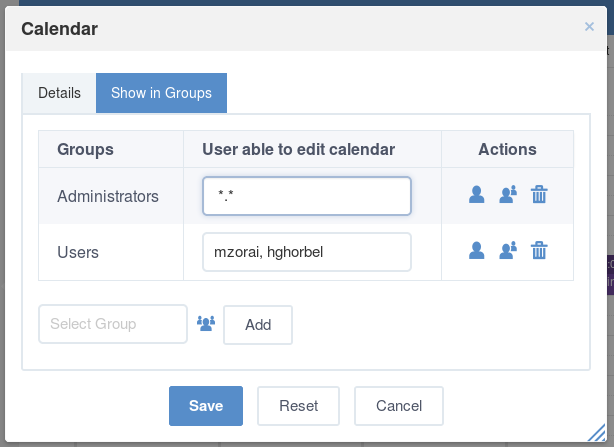 All group calendars will be put in the Group Calendars pane. Follow steps as stated in Creating a personal calendar to give details for your new calendar. Select the Show in Groups tab. Select groups that contain your created calendar. The users of the selected groups can only view this calendar. help you select a group that you want to share. iii. Click or to grant permissions to specific users or memberships respectively from the selected group. If you set the * membership in the User able to edit calendar column, all users of the selected group will be able to edit this calendar, regardless of their membership role. You can select more users/memberships by repeating the above steps. The selected users/memberships will be updated in corresponding textboxes. You can delete your selected users/memberships manually in the textboxes or click to remove the permissions. Click Save to finish creating your new group calendar. To create a remote calendar in the Calendar application successfully, you need to learn about the calendar settings of the relevant provider. For more information about types of remote calendars, see here. Click , then select Remote Calendar from the drop-down menu. The Subscribe Calendar form appears. Select the type of the remote calendar: iCalendar or CalDAV. Enter the URL linking to your calendar server in the URL field. Click Next to go to the Remote Calendar form. Fill in the fields. The asterisk (*) indicates the field is mandatory. Tick the Use Authentication checkbox, then enter the username and password of your remote calendar server if the remote server requires verification. Click Save to accept your creation. After creating a remote calendar, you can ONLY VIEW all events and tasks which are created in the remote calendar server right in the Calendar application by clicking it. To get the updates, hover your cursor over the remote calendar, then click to select Refresh from the drop-down menu. 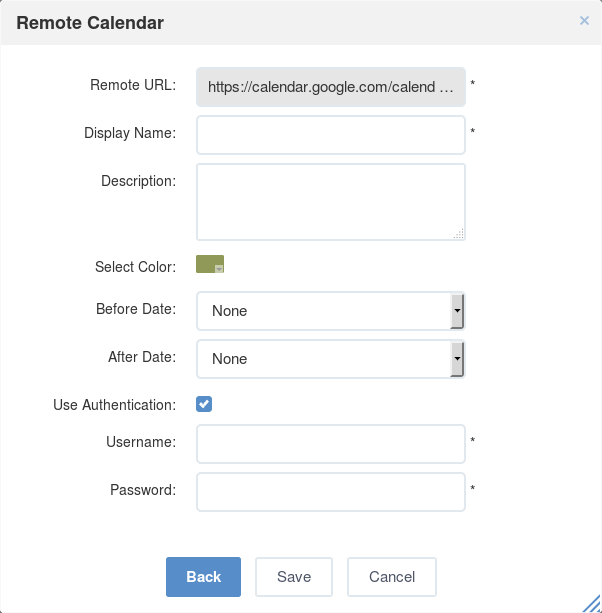 iCalendar provides a link to an online .ics file from another calendar servers, such as Google Calendar, Yahoo Calendar, or eXo Calendar (including public URL or private URL). CalDAV is an open protocol that allows you to access calendars via WebDAV. 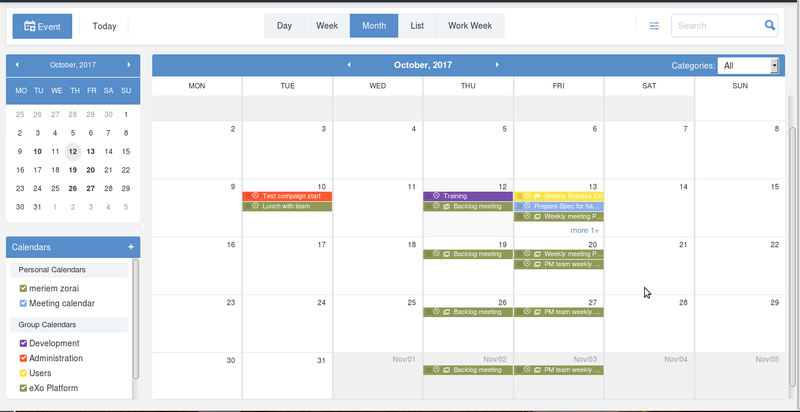 With CalDAV, you can publish and subscribe to calendars, share them collaboratively, synchronize among multiple users or devices. 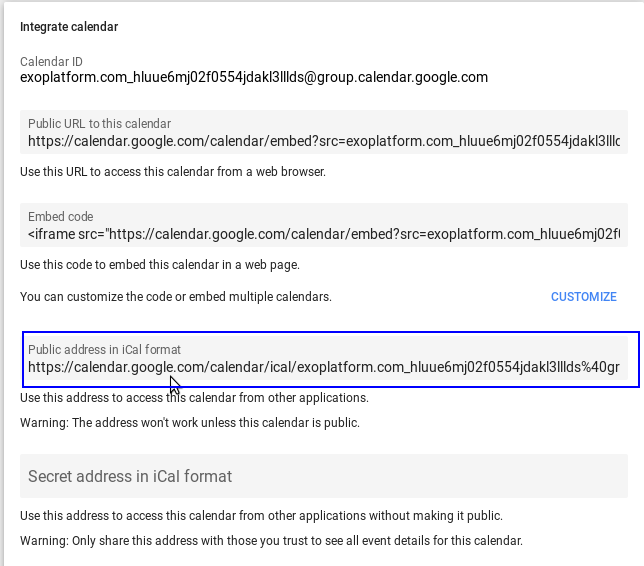 Google: https://apidata.googleusercontent.com/caldav/v2/calid/events where calid is the calendar id to be accessed. 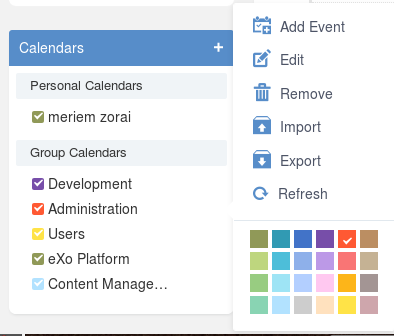 Go to your Google calender interface and select the calendar you wish to import to eXo Platform. 2. 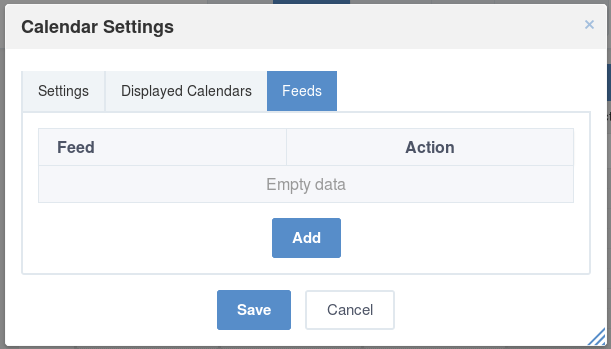 Click on options button of the chosen calendar and then select Settings and sharing. An interface Settings appears, scroll down to the section Integrate calendar and copy your calendar’s public link in iCal format. 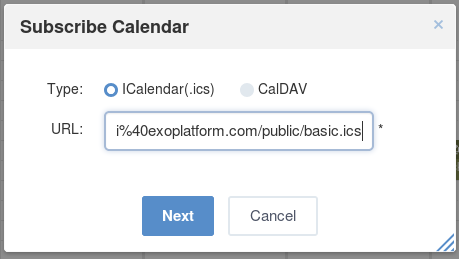 Go to the calendar interface in eXo Platform and click on the then on Remote calendar. Paste the iCal link to the field URL. Click on Next to move to the form in calendar settings. Fill in the needed fields. If the imported remote calendar is not public, you should input your google account credentials in the “Authentication” section to enable the import procedure. You can ONLY edit personal calendars and group calendars that you created. For group calendars which are created by another users, you can ONLY edit them if you are granted the Edit permission. Meanwhile, for shared calendars, you cannot edit them. If you are granted the Edit permission on them by the calendar creators, you can ONLY have the right on their tasks or events (for example, adding/modifying/deleting, exporting/importing). 1. Hover your cursor over the calendar which you want to edit, then click that appears. Click Edit from the drop-down menu. The form to edit the calendar will be different, depending on your selected calendar type. For example, if you select a personal calendar, the form only contains the Details tab. Make changes on the calendar, then click Save to accept your changes. The Calendar application allows you to select different colors for all types of calendars to recognize them easily. 1. Hover your cursor over the calendar which you want to set the color, then click that appears. Select one color from the available 24-color palette. This function allows you to remove any calendars and all their events. You cannot delete group calendars created by another users if you are not granted the Edit permission. Hover your cursor over the calendar which you want to delete, then click that appears. Select Remove from the drop-down menu. Click Yes in the confirmation message. You can only export the calendar which contains at least one event. Besides, for shared and group calendars, you can only export/import them if you have the Edit permission. This function allows you to export a calendar and its events into a separate file on your device. Hover your cursor over the calendar which you want to export, then click that appears. 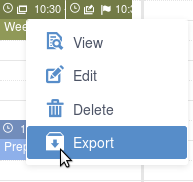 Click Export from the drop-down menu to open the Export Calendar form. Enter the exported file name in the File Name field. The export format is iCalendar by default. Click Save to finish your export. You can only open the exported file if you have an application installed on your device that supports its format. This function allows you to import one calendar from your device to a selected calendar in Calendar. Hover your cursor over the calendar which you want to import, then click that appears. Click Import from the drop-down menu to open the Calendar form. Select a format type from the Format drop-down menu. At present, only the .ics and .csv formats are supported. Click Select File to open a window that allows you to browse your selected file. Select your desired file from your local device, then click Open to upload it. Click next to the name of your uploaded file if you want to remove it and upload again. 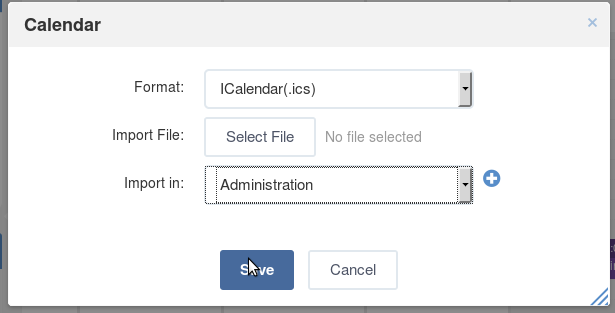 Or, create a new calendar where your uploaded file is imported by clicking next to the Import in field. Click Save to finish your import. This function allows you to share your personal calendar with other users, so that they can participate in all activities of this calendar. 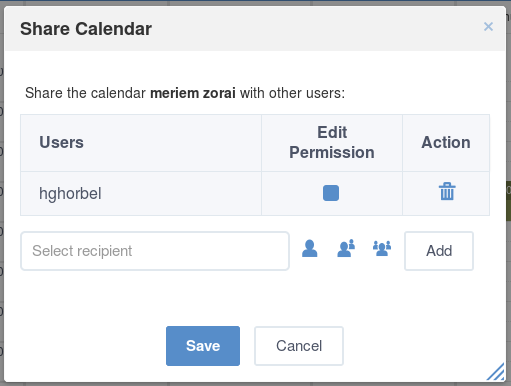 View permission allows shared users to view the shared calendar and its events/tasks, but cannot change any information. It means that the shared users cannot add/edit/delete events or tasks, or edit, import and export the shared calendar. Edit permission allows shared users to view, import and export the shared calendar or add, edit, delete events/tasks inside the shared calendar. However, you cannot edit detailed information of a shared calendar, such as its display name. If other users share their calendars with you, you will see them in the Shared Calendars category even after the users are suspended. Hover your cursor over the calendar which you want to share, then click that appears. Or enter name of users, memberships or users into the text-box manually, separated by commas. If you set the * membership for a group, all users of the group will be able to access this calendar, regardless of their membership role. Click to add your selected ones. Check the Edit Permission checkbox if you want to grant the Edit permission to the corresponding users/memberships/groups. Click Save to accept sharing your personal calendar. You cannot abort your sharing till the process is finished. Remove and Refresh, if the Read permission only is granted. Add Event, Add Task, Remove, Import, Export and Refresh, if the Edit permission is granted. iCal provides a link that allows users to download a *.ics file which contains all events and tasks of a calendar. iCal is supported by many popular products, such as Microsoft Outlook, Google Calendar, Apple iCal. Public URL: The Public URL link allows you to share your calendar with other users. They do not need to have Calendar accounts to download the file, but they must use a calendar application which supports the .ics to open and view it. By default, Public URL is empty and it is only accessible when public access is explicitly enabled. Private URL: iCal is used for personal use. It means that as the creator of the calendar, you can download it to your computer and use any calendar applications which support the .ics format to open it. You can also import it into another calendar. Hover your cursor over the calendar which you want to get iCal, then click that appears. Click Edit from the drop-down menu to open the Calendar form. Get a Public URL or Private URL by clicking . For Public URL, you must assure that the iCal is public. If it is not public, simply click the “Disable Public Access” link. One Calendar Feed form will pop up. Copy the link in the Calendar Feed form, then send it to another users. The shared users can use this link to download the .ics file which can be opened in popular calendar applications, such as Microsoft Outlook, Google Calendar, Apple iCal. Ways to create new events, including Quick adding an event and Adding a detailed event. Instructions on how to edit an event. Steps to change the start date and time of an event conveniently via the Drag and Drop feature. Instructions on how to export and import an event. Instructions on how to remove an event from a calendar. Hover your cursor over the event to see its detailed view. 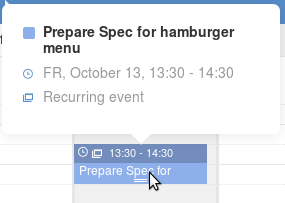 Right-click the event in the Calendar View pane, then select View from the drop-down menu. The Preview form will appear. At the Preview form, if the event includes attachments, you can download them by directly clicking its title. If the attachment is an image, you can also click View to preview it. Right-click the Calendar View pane, then select Add New Event from the drop-down menu. Hover your cursor over the calendar which you want to add new events, then click that appears. Click Add Event from the drop-down menu. Click the appropriate time slot in the calendar view pane. Drag your cursor to alter the length of the event. For more details, see here. ==> The Add Event form appears in the right of the screen. Title The event title which is required. Event Category The category which contains the event. From The start date and time of the event. To The end date and time of the event. All Day If the event does not have a specific time, select the All Day option. This option allows setting the event duration to be all day or not. If you do not check this option, you have to define the start date/time and end date/time. By default, the start date and end date is the current date. Location The Place where the event will occur. Participants Persons to be invited to the event. Calendar The calendar which contains the event. Description The detailed description of the event. Attachments Files to attach to the event. To create an event, you don’t have to fill all the fields cited above. You can just fill mandatory fields to add an event in your personal calendar. When you right-click to add an event, the start date and time are where the click occurs and the default duration is one hour. When you click Event on the top left corner of Calendar or Add Event by selecting , the start date is the current one with duration of 1 hour. When you select a start date/time, an end date/time will be suggested. You can select another values to your desires. 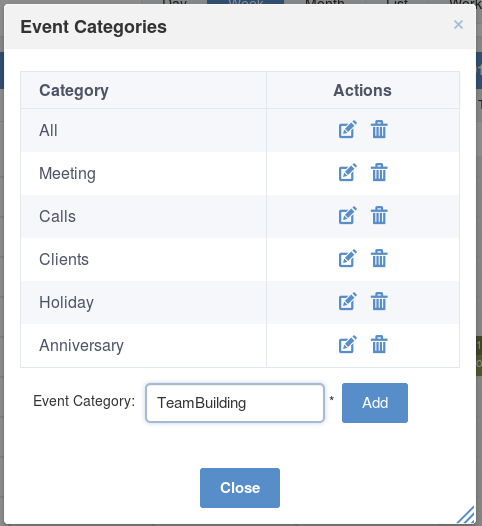 You can click “Save” to finish creating your new event in your persanal calendar or you can fill in more fields for a detailed event. Add participants to the event and check their availability. Select the calendar where you wish to add your event. Create a reminder for upcoming events with your own notification settings. Save time by creating a recurring event rather than entering each instance separately. Add description of the event. You can attach a maximum of 10 files to an event. Also, the size of each file must be less than 10 MB. Tick the Repeat checkbox to open the Recurring Event form. Select the type of your repeating event from the Repeat option. Daily: The event will be repeated every day. Weekly: The event will be repeated every week that is set by default. Monthly: The event will be repeated every month. Yearly: The event will be repeated every year. Select the frequency and date for repeating your event in the Repeat every and Repeat on fields respectively. The selected frequency will work on the Repeat value. For example, if you set Weekly in Repeat, 5 in Repeat every and WE in Repeat on, the event will be repeated every 5 weeks on Wednesdays. Select the option for ending your repeating event by ticking the relevant checkbox. Never: Your repeating event will never end. After [X] occurrences: Your repeating event will end after a defined number of occurrences. By this date: Your repeating event will end before your specified date. Point your cursor over the textbox and select the date from the drop-down calendar. The Calendar application provides 2 options for reminding users who will take part in events. A reminder includes the summary information of the event, such as title, time and location. To use this feature, juts activate the Reminder option. Remind by Email: This option is to remind users of upcoming events via emails. This option is set default. If you do not use this option, simply untick the checkbox. Remind by Email before the event starts The interval time that the reminder will be repeated before an event starts. Display a notification pop-up Remind users of upcoming events via pop-up messages. If you want to invite people to attend at an event, fill in the Participants field. When typing in the field, type-ahead suggestions will appear below for easier selection of users. Participants will receive invitations via emails. Their statuses will be updated in the Status column after they have answered the invitations via emails. If the participants agree to participate (by clicking Yes in their received invitation emails), their statuses will be yes. If the participants do not agree to participate (by clicking No), their statuses will be no. If the participants have not decided to take part in the event (by clicking Not sure), their statuses will be pending. 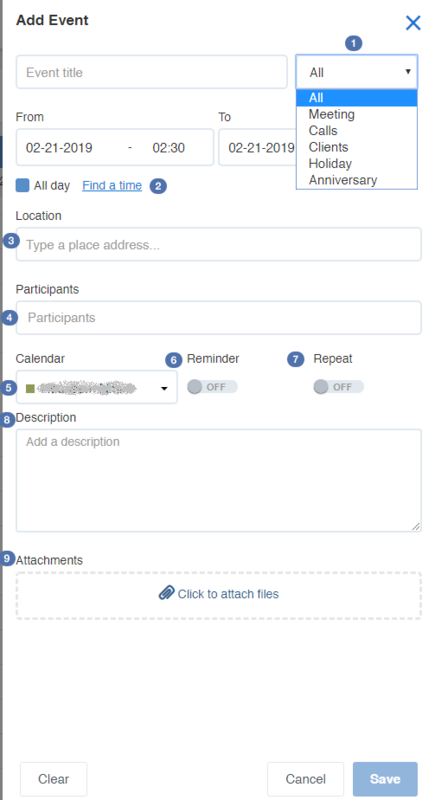 Also, participants can import the event directly into their calendars or jump to the calendar by clicking the relevant links in the invitation emails. Click on Find a time link on Add event form to select the correct event’s start and end time, depending on participants’ availabilities. By default, it is the start and end time of the event which you defined in the Add event form. 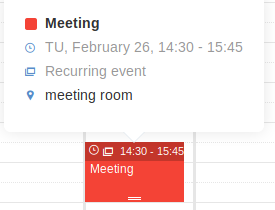 Busy periods are displayed in red so you can easily detect the schedule conflicts to manage the alternate meeting time that works best for all participants. You can schedule the event (its start/end time) by dragging and dropping. The selected period is displayed in green. Click in the left pane to select users from the Select Users form. 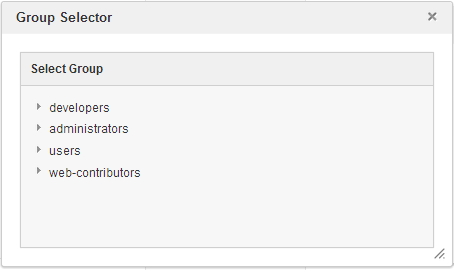 Tick the checkboxes corresponding to users in the Participants list, then click . The deleted users will be removed from the participants list. It is required to have at least 1 user in the Participants list. 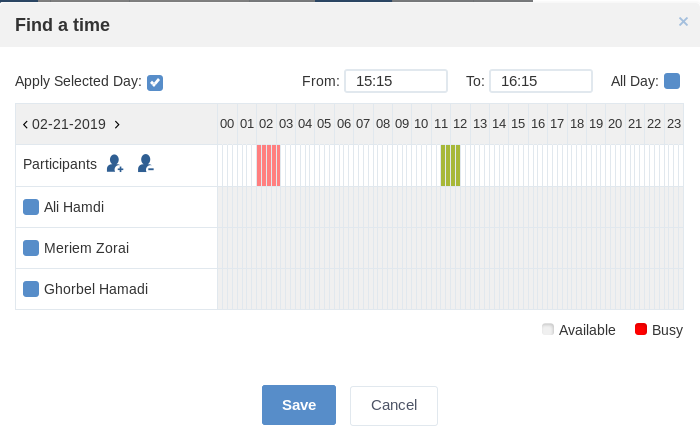 Or, hover your cursor over the time pane to visually select the available time of users. The selected period will become green and the corresponding time will be automatically updated into the From and To fields. If you do not see any available time for your selected date in the time pane, you can switch to another dates by clicking / to check another time availability of users. Click the Apply Selected Day checkbox to accept applying your selected date and time into the Details tab. Double-click the event you want to edit. Right-click the event that you want to edit and select Edit from the drop-down menu. The Edit Event form is displayed with information already filled when adding your event. Edit information of your event, then click Save to complete. When you are editing the start time, the end time will remain the same as previously selected. Only this event: The changes will be applied into the selected event only. 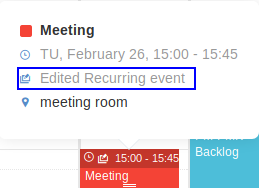 This event will be marked with the text: “Edited Recurring event”. Following events: The changes will be applied into the selected event and the following events of the series. All events: The changes will be applied into all events of the series. For shared and group calendars, you can only edit their events if you have the edit permission. When editing an event, you can add/remove the attachment files or download them by directly clicking their titles. 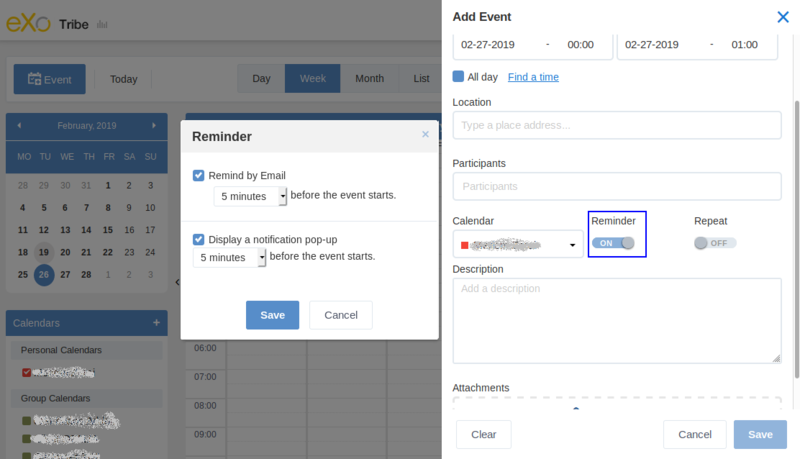 If you only want to change the start date and time of the event, you can also use the drag-and-drop feature to edit the time for the event directly on the Calendar View pane. The drag-and-drop feature helps you change the start date and time of an event more conveniently. 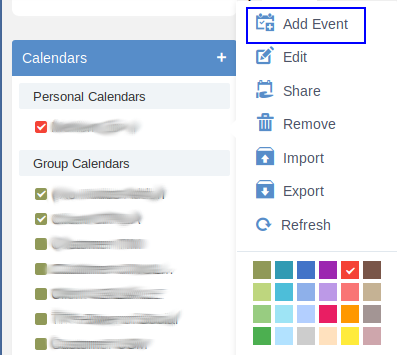 You only need to click the event, drag and drop it into another date or new time area in the Calendar View pane. You also can hover your cursor over the Scroll button to alter the event period. 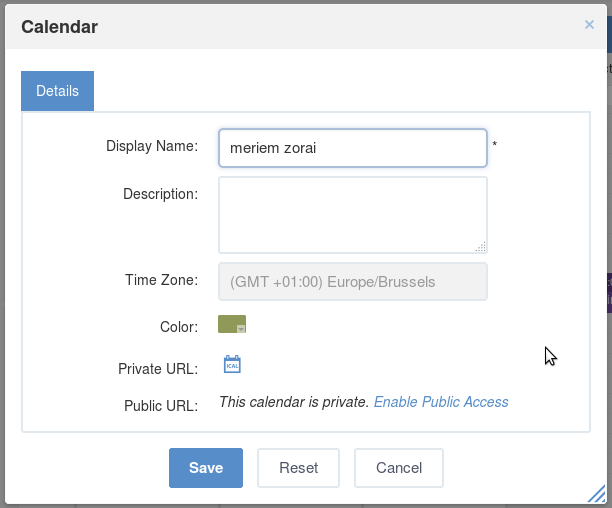 According to the features of the Calendar pane view, the drag-and-drop feature can be applied to the date and time differently. In the Day view, all events are shown in a day, so you can change the time of the event in one day only. In the Week and Work Week views, all events are shown in a week, so you can change both the event time and the event date. In the Month view, all events are shown in a month, so you can change the event date only. You can also change more events at the same time by ticking their checkboxes and using the drag-and-drop feature. For shared and group calendars, you can only drag and drop their events if you have the Edit permission on these calendars. If you drag and drop an event of one calendar on which you do not have the edit permission, you will get a warning message. This function allows you to export one event into a file on your device. This file can be imported to use in another Calendar application. 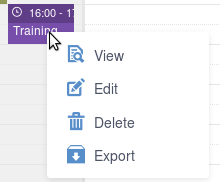 Right-click the event that you want to export, then select Export from the drop-down menu. The Export Calendar form will appear. Enter a file name, the export format is iCalendar by default. Click Save to accept exporting the event. Click OK in the confirmation message to save the exported file into your device. In fact, exporting an event means exporting a calendar with one event only. Therefore, the exported file format and the way to export an event is similar to the way to export a calendar with multiple events. You can import an event into a specific calendar. The process to import an event is similar to importing a calendar. For more details, see Importing a calendar. This function allows you to remove events from a calendar. To do this, simply right-click the event you want to delete, then select Delete from the drop-down menu. Select Only this event to delete the selected event only. Select Following events to delete the selected event and following events of the series. 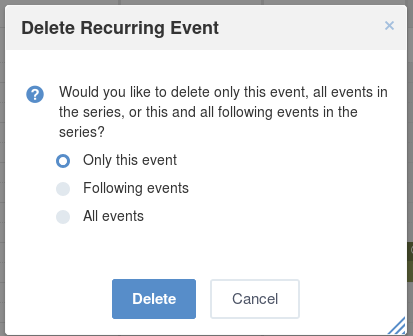 Select All events to delete all events of the series. 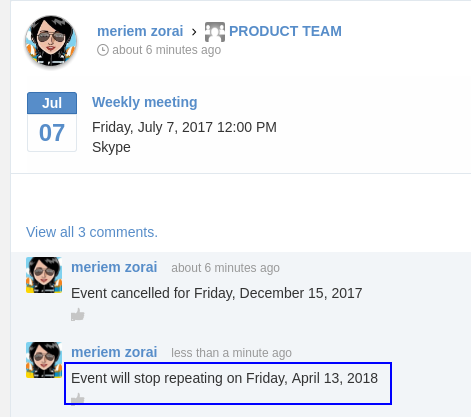 When you delete an edited recurring event in a space calendar, its activity on the activity stream is also deleted and a comment informing the date of the event cancelled is added to the main activity of the series. 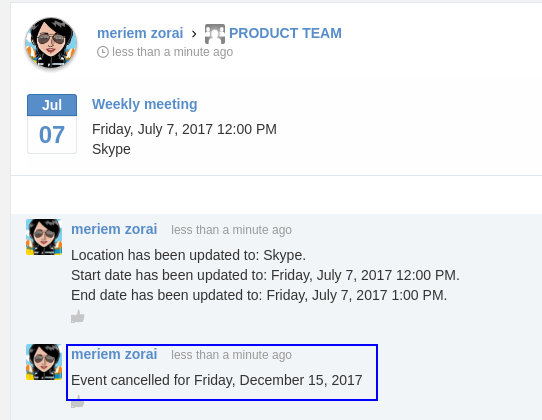 If you select Only this event, a comment informing the date of the event cancelled is added to the main activity of the series. 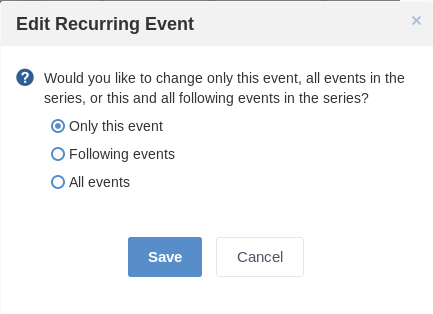 If you select Following events, and in case there are activities for some future edited recurring events of the series, they are deleted and a comment informing the date of repetition stop is added to the main activity of the series. If you select All events, the main activity of the series is deleted. In the Month view, you can delete one or multiple events at the same time. Tick the checkboxes corresponding to the events you want to delete. Click on the Month information bar. Click Delete in the confirmation message. For shared and group calendars, you can only delete their events if you have the Edit permission on these calendars. The first way: Click on the Calendar toolbar. The second way: Click , then select Calendar Settings from the drop-down menu. Default View The view type of Calendar View pane. 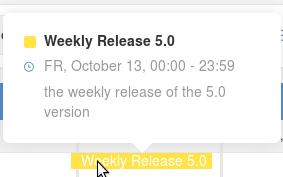 You can define the default view type when you start Calendar (Day, Week, Month, List, Work Week). Date Format The date format which is displayed in Calendar, such as Starting date, Ending date in events/tasks. Time Format The time format which is displayed in Calendar, such as time of Starting date, or Ending Date and time displayed in the Calendar View pane. Time Zone The default time zone displayed in Calendar. Week Start on The first day of the week displayed in the Week and Work Week views. Show Working Times Clicks the checkbox to display the working times when viewing the calendar. The working time can be defined by selecting Starting and Ending time. Never: Calendar will not send invitations. 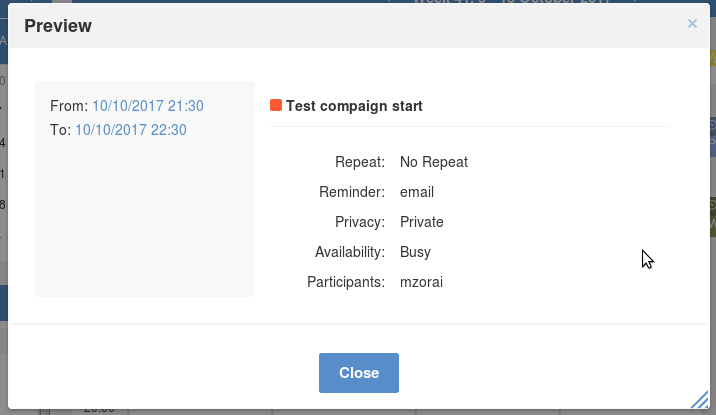 Always: Calendar will send invitations automatically to the participants. Asked: Calendar will ask you whether to send invitations or not. ii. In the Displayed Calendars tab, you can define which calendars to be displayed in the Calendar application by simply ticking checkboxes. iii. In the Feeds tab, you can generate an RSS feed as stated in Generating RSS. 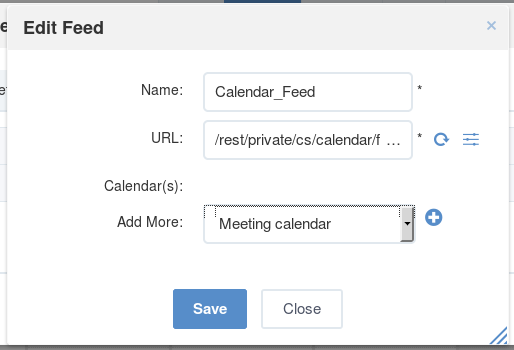 This function allows you to publish your calendar as an RSS feed. It will build a URL that helps you keep track of all events via the RSS reader. 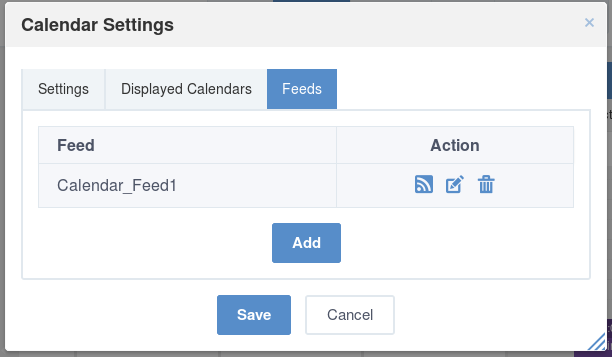 Follow Step 1 <EditingCalendarSettings> to open the Calendar Settings form, then select the Feeds tab. Click Add to open the Edit Feed form. Name The name of the feed (required). URL The link of the feed (required). Calendar(s) The calendar(s) which you will get feeds. Add More Adds the calendar that you want to get RSS feed. Input the name of RSS in the Name field. Click to generate the RSS link. The URL will be automatically generated into the URL field. Click to reset the RSS link. Select the calendar name that you want to get the RSS feed in the Add More field, then click to add your selected calendar. Click corresponding to the calendar name to delete your added calendar. Click Save to accept generating the feed, then click OK in the notification message. The created feed will be shown as below. Click to get the RSS feed link which can be used in an RSS reader application to directly view your calendar events and tasks. Categories are used to classify events and tasks. For example, you could use a ‘Meeting’ category for all meetings with your colleagues or customers in your company. By default, PRODUCT provides 6 available categories in Calendar: All, Calls, Meeting, Holiday, Clients, Anniversary. You can add and view events/tasks in default categories. In addition, you also can edit, delete default categories or create new categories by yourself. To manage categories, click , then select Add Event Category from the drop-down menu. The Event Categories form will appear. Simply enter the category name (that does not contain special characters, for example #,$) in the Event Category field, then click Add to add this category. Edit a category by clicking . Next, enter a new name in the Event Category field, then click Update to apply your changes. Delete a category by clicking . Next, click Yes in the confirmation message. The events/tasks under the deleted categories are still kept. These events will then be auto-assigned to the default All category.